Philosophy in ancient Han was mainly made of Confucianism, and Confucianism was the state belief. The reason that the previously popular Legalism was not used was because they were associated with the hated Qin dynasty. Taoism was popular, and drugs and potions were sought that would prolong life; alchemy was researched. This picture shows what Taoists perceived could be eternal life, a series of triangles, and this was probably believed because of the dizziness after drinking a potion. Finally, Han dynasty art was very detailed. 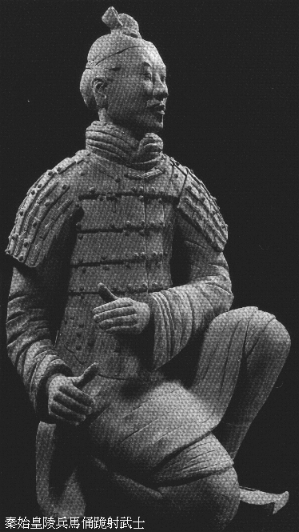 Below is shown a Han warrior, one who would probably have defended the emperor or the Great Wall from Xiong Nu invaders. "Chinese Culture." 2 Jun 1999. http://academic.brooklyn.cuny.edu/core9/phalsall/images/han-jar.gif. 12 Mar 2003. "Chinese History." A universal guide for China studies from China knowledge. http://www.chinaknowledge.de/History/Han/qin.htm. 11 Mar 2003. "Daily Life in Ancient China." 23 Oct 2002. http://members.aol.com/Donnclass/Chinalife.html#HAN. 12 Mar 2003. "Tantra." 16 June 2001. http://www.kheper.net/topics/Tantra/Tantra.htm. 12 Mar 2003. World History. Before 1600: THe Development of Early Civilization. USA: Wadsworth, 2002.